A rare object in a crystal showcase. Accommodating a precious item of clothing entails a greater commitment than the one undertaken by the article in showing itself. The refined synthesis of fabrics and weaves, of the clothes’ aesthetic sensitivity, finds a fertile soil in which to flourish. 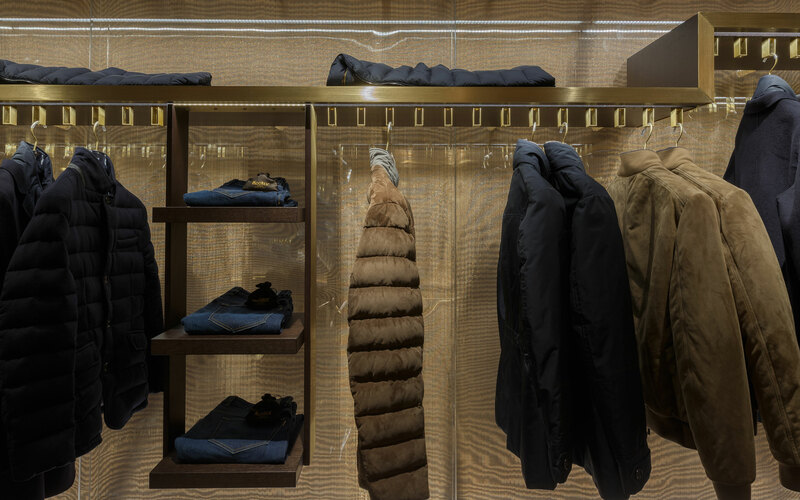 The space honors the garment on display by simply hanging it with extreme care and becoming valuable itself as a consequence. The attentional dimension is prompted by a specific relationship between space and light. It springs from a balanced and dramatized luminous presence, from how it reveals itself and how it guides the eye towards certain aspects of the place. 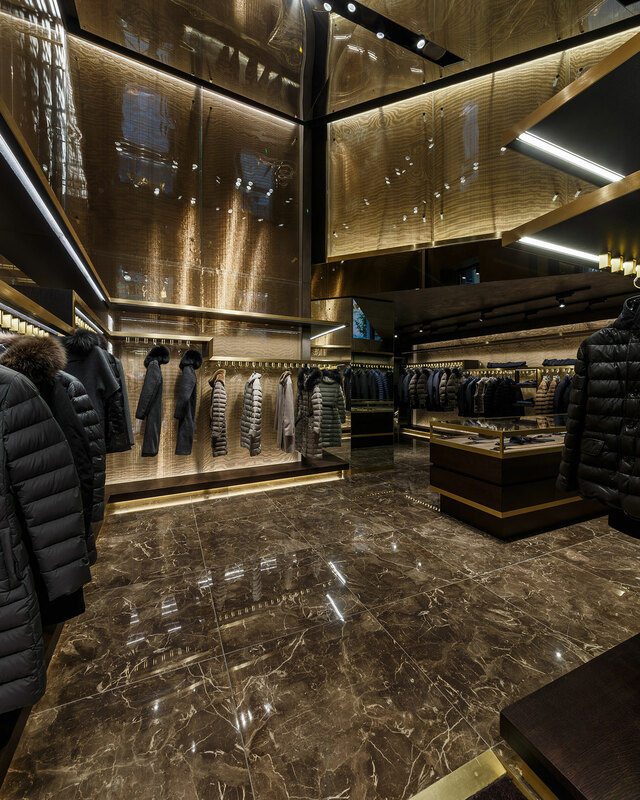 The space acquires body and depth the minute it is flooded with light which eliminates each and every visual and formal distraction, allowing the displayed garment to emerge as the absolute protagonist. 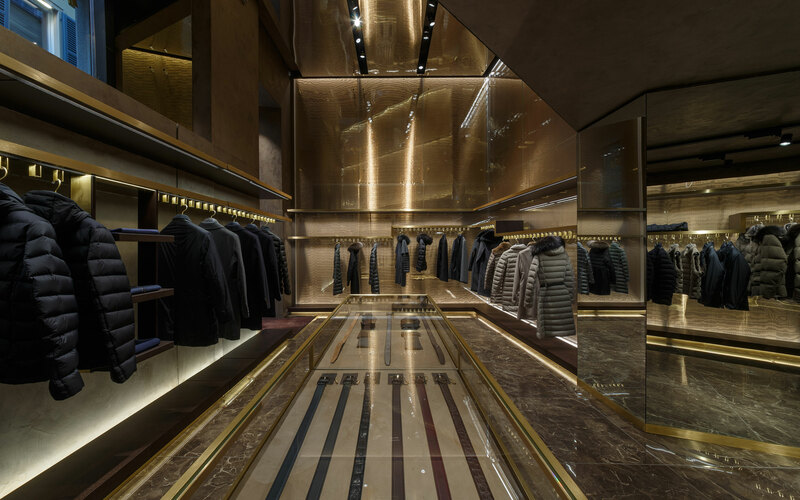 To convey the refined technology with which the brand expresses its products, I envisioned a luminous wall that reinterprets the presence of gold in the space through a special bronze fabric inserted in a sheet of crystal, behind which a reflective and corrugated surface highlights the mesh’s iridescence and weaving, in a constant and dynamic moire effect. By looking or walking along the wall, one can perceive a continuous undulatory movement of the golden weft, like a precious brocade tapestry in constant metamorphosis. 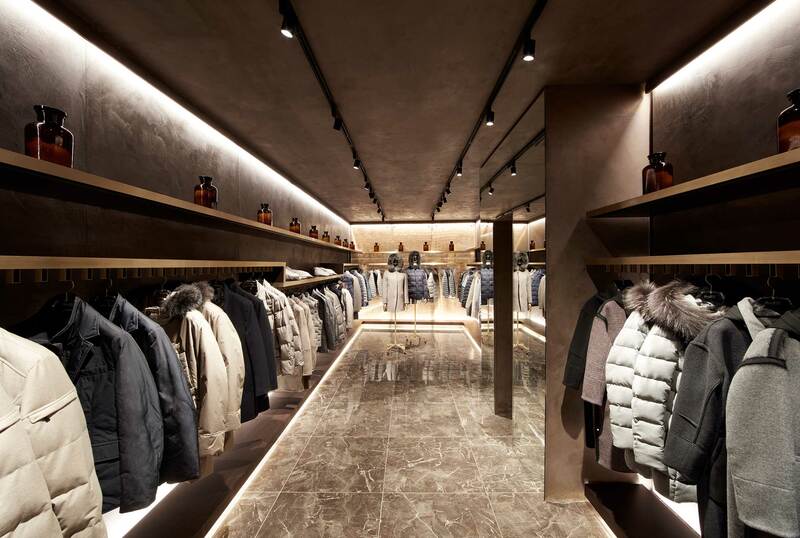 This wall becomes the main tactile brand avatar, in front of which the hanging garments seem to float in a glowing atmosphere. 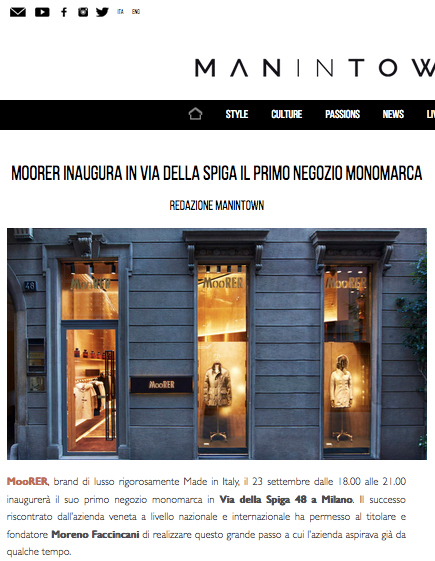 Touching and wearing a Moorer garment is a necessary experience for grasping its values. 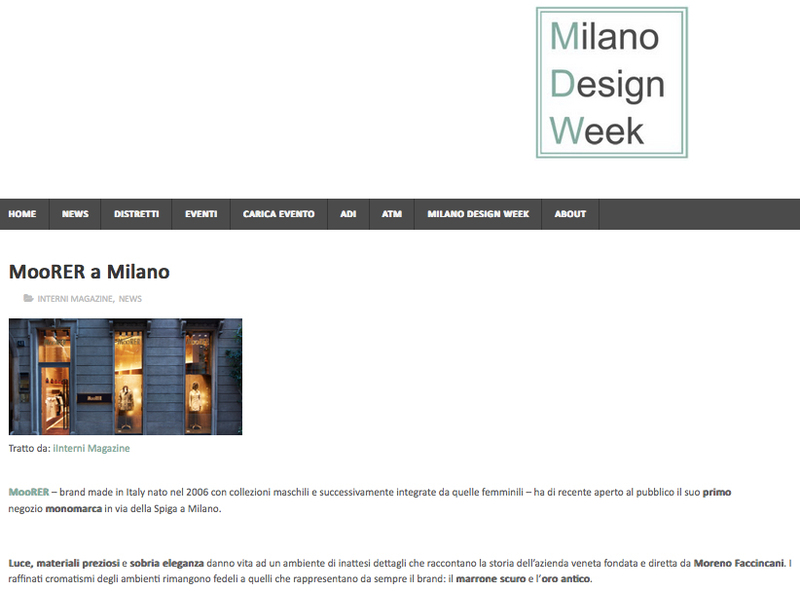 The outside is characterized by a basic and austere rigor, understated and yet formal and extremely elegant. Its inside unveils an unexpected world of polished details and intrinsic richness that tell a unique story. 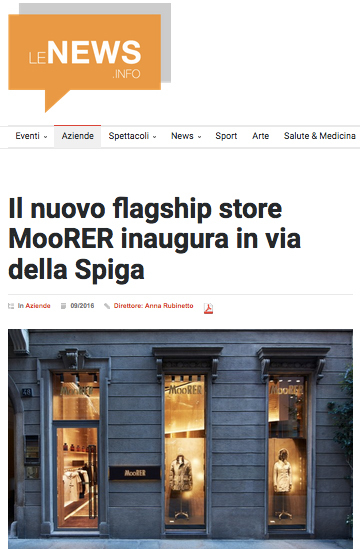 The Moorer store accommodates and symbolizes these two opposites. 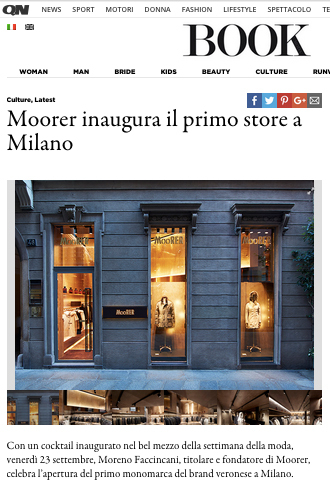 I imagined a container consisting of golden light, of precious yet natural matter, where Moorer’s chromatic palette, dark brown and antique gold, could be transformed into the brand’s material avatars. 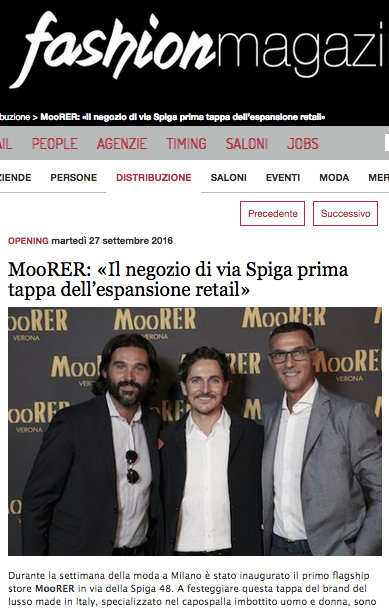 High tech/high touch: technology and naturalness combined to bring about a fresh visual and tactile quality of Moorer’s space. 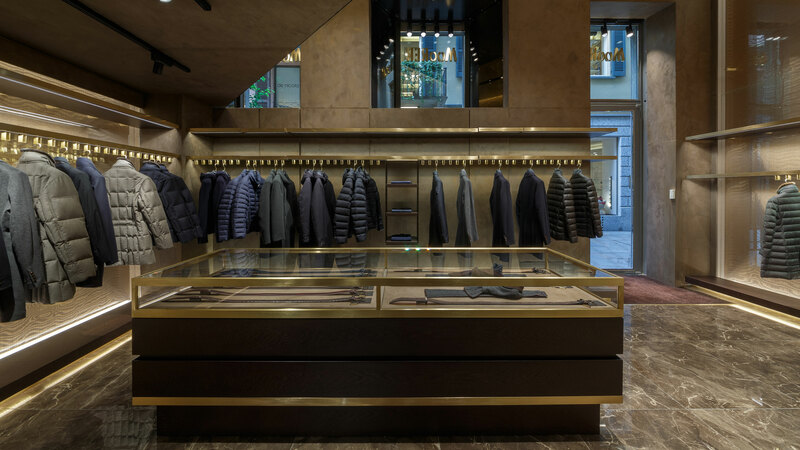 The space has two primary material elements: the illuminated golden surface and the natural wall in a bronze-brown tone that covers walls, ceilings and display backdrops. To get this result I employed marble dust, earthen pigments and natural oxides mixed with beeswax and bronze dust, to obtain a noble and smooth surface with a refined and archaic look. 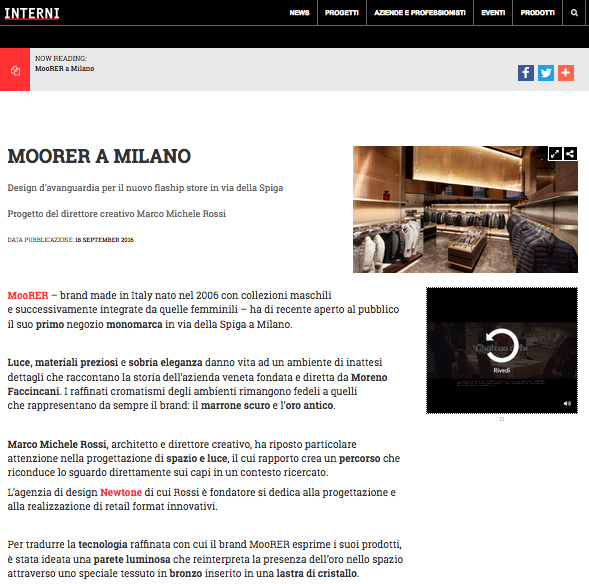 The design research that has been conducted and applied in this context, is not limited to going beyond a minimalistic approach to space but it intends to redefine it with a descriptive modality based on sobriety and richness of details. One strong intuition is enough to characterize the space. Two golden and continuous horizontal bands along the walls define the perspective lines. They suggest a clear path to follow and separate the volumes. The shelves draw two steady contours without interruption along the walls, at times changing height to enliven the display. 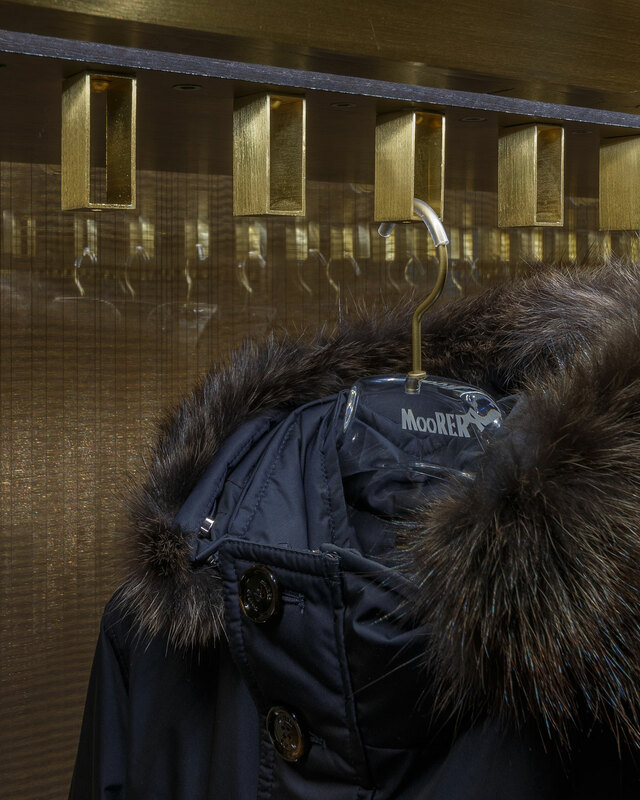 Traditional clothes-hanger bars are substituted with single brushed brass square loops that emphasize the importance of each garment, making it stand out along the walls and spotlighting its uniqueness. From an abstract and minimal container to the experiental symbiosis of space and product. 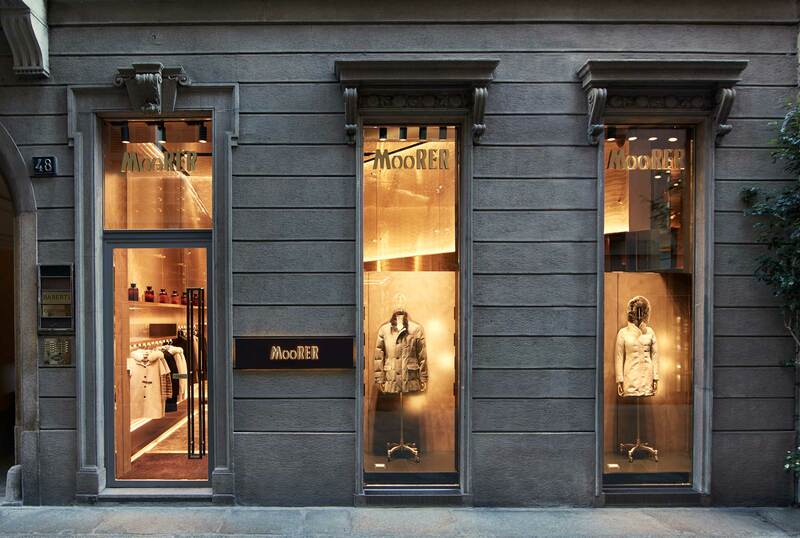 Moorer’s mood radiates from the shop-windows towards the street, thanks to the dynamic alchemy of the illuminated golden walls. 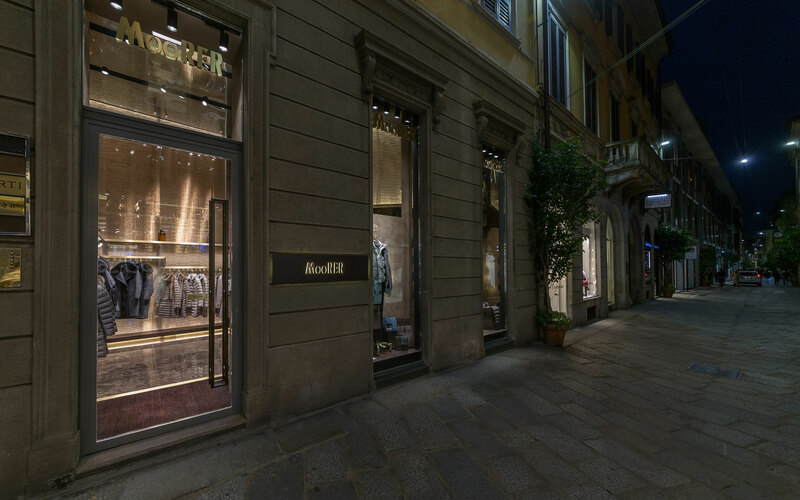 A welcoming and enveloping space in which the artificial natural lighting emphasizes the precious and vibratile weaves as well as the garments’ chromatic range and extremely elegant details. The materials employed for the container vary in surface, brilliance, origin and matter but they collaborate synergistically to define an inviting habitat, a pleasantly discreet sensation, suited to enhancing the content‘s prime qualities. 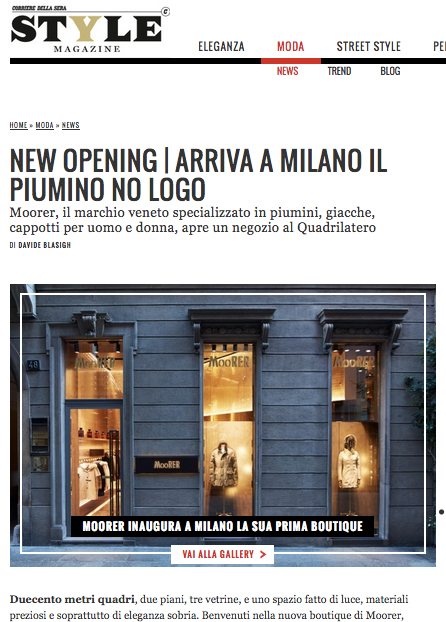 New Opening. 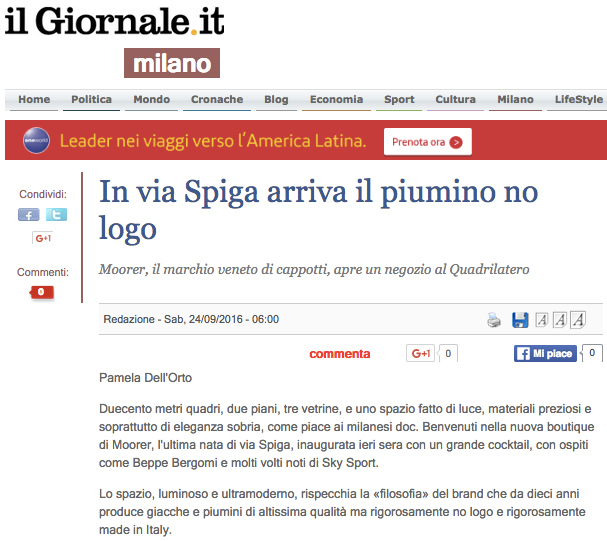 Arriva a Milano il piumino no logo.